In communicating with companies whose products are described in this department, please mention PROFITABLE HOBBIES. 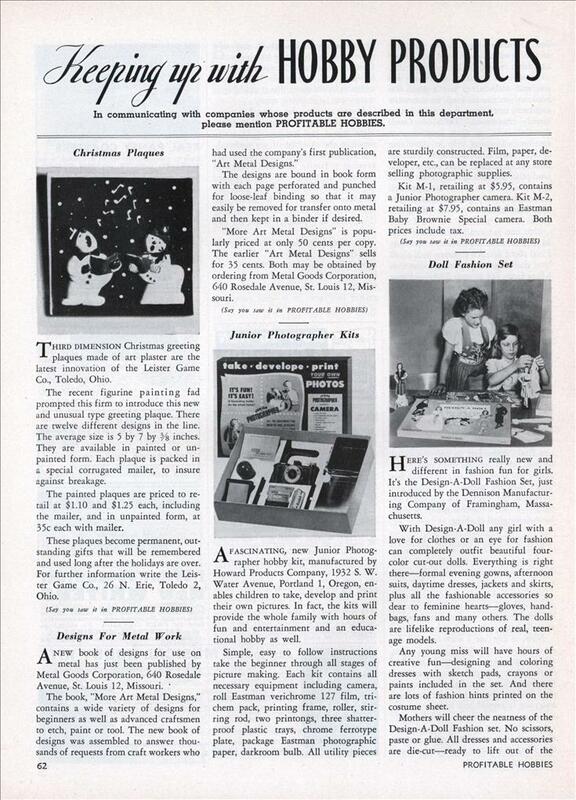 Third dimension Christmas greeting plaques made of art plaster are the latest innovation of the Leister Game Co., Toledo, Ohio. The recent figurine painting fad prompted this firm to introduce this new and unusual type greeting plaque. There are twelve different designs in the line. The average size is 5 by 7 by 3/8 inches. They are available in painted or un-painted form. Each plaque is packed in a special corrugated mailer, to insure against breakage. The painted plaques are priced to retail at $1.10 and $1.25 each, including the mailer, and in unpainted form, at 35c each with mailer. These plaques become permanent, outstanding gifts that will be remembered and used long after the holidays are over. For further information write the Leister Game Co., 26 N. Erie, Toledo 2, Ohio. A new book of designs for use on metal has just been published by Metal Goods Corporation, 640 Rosedale Avenue, St. Louis 12, Missouri. The designs are bound in book form with each page perforated and punched for loose-leaf binding so that it may easily be removed for transfer onto metal and then kept in a binder if desired. “More Art Metal Designs” is popularly priced at only 50 cents per copy. The earlier “Art Metal Designs” sells for 35 cents. Both may be obtained by ordering from Metal Goods Corporation, 640 Rosedale Avenue, St. Louis 12, Missouri. A fascinating, new Junior Photographer hobby kit, manufactured by Howard Products Company, 1932 S. W. Water Avenue, Portland 1, Oregon, enables children to take, develop and print their own pictures. In fact, the kits will provide the whole family with hours of fun and entertainment and an educational hobby as well. Simple, easy to follow instructions take the beginner through all stages of picture making. Each kit contains all necessary equipment including camera, roll Eastman verichrome 127 film, trichem pack, printing frame, roller, stirring rod, two printongs, three shatterproof plastic trays, chrome ferrotype plate, package Eastman photographic paper, darkroom bulb. All utility pieces are sturdily constructed. Film, paper, developer, etc., can be replaced at any store selling photographic supplies. Kit M-1, retailing at $5.95, contains a Junior Photographer camera. Kit M-2, retailing at $7.95, contains an Eastman Baby Brownie Special camera. Both prices include tax. Here’s something really new and different in fashion fun for girls. It’s the Design-A-Doll Fashion Set, just introduced by the Dennison Manufacturing Company of Framingham, Massachusetts. With Design-A-Doll any girl with a love for clothes or an eye for fashion can completely outfit beautiful four-color cut-out dolls. Everything is right there—formal evening gowns, afternoon suits, daytime dresses, jackets and skirts, plus all the fashionable accessories so dear to feminine hearts—gloves, handbags, fans and many others. The dolls are lifelike reproductions of real, teenage models. Any young miss will have hours of creative fun—designing and coloring dresses with sketch pads, crayons or paints included in the set. And there are lots of fashion hints printed on the costume sheet. Mothers will cheer the neatness of the Design-A-Doll Fashion set. No scissors, paste or glue. All dresses and accessories are die-cut—ready to lift out of the sheet. Costumes simply slip on the dolls. No hooks or tabs. Dennison Design-A-Doll Fashion Sets are available in three sizes: No. 41—$2 —contains four dolls; No. 21—$1—contains two dolls, and No. 11—29 cents —contains one doll. CALLED THE Bell Professional Yarn-Winder, a clever home device is announced which enables anyone to wind 240 feet of yarn in two minutes, thus eliminating the drudgery of winding yarn by hand. So simple are the directions and so easy the operation that no practice is necessary. Even a child can convert a skein into a neat, professional-appearing ball of yarn of just the right density in a jiffy. The winder consists of (a) a metal base plate, 21″ long by 2″ wide to which are attached four vacuum cups; (b) a notched spindle and crank assembly; and (c) a revolving metal skein-holder, equipped with pegs adjustable to from 12″ to 22″ in diameter. In use, the unit is first made secure to a table or any flat surface by means of the vacuum cups. Next, the skein of yarn is draped over the four pegs of the skein-holder, adjusting the pegs so as to hold the skein firmly. The yarn end is then threaded through a loop in the base plate and onto the notched spindle. By turning the crank, the spindle is rotated, thereby winding the yarn easily, smoothly and evenly off the revolving skein-holder. The user may set the pegs in just the proper holes to accommodate any skein size or weight, including crochet thread. Thanks to its lightness in weight (only about two pounds) the winder may be taken conveniently on vacations, train trips or neighborhood visits. It is absolutely foolproof—nothing to get out of order. Retail Price: $2.98. For further information write Jo-Bell Products, 4840 S. St. Louis Ave., Chicago 32, Illinois. 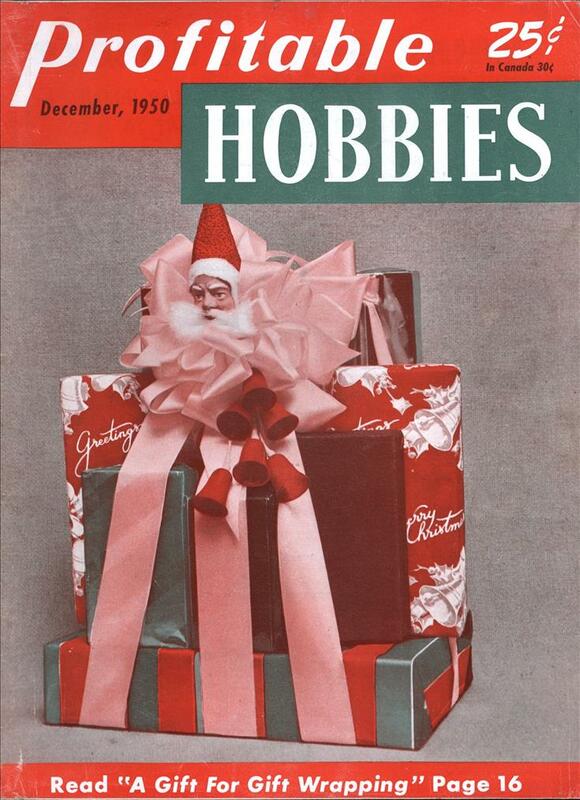 An array of fun-to-paint Christmas decorations for front doors and shutters, for party tables, Christmas tree stands, toys, and an enchanting playhouse have been created as suggestions for the amateur by Peter Hunt, noted Provincetown artist. He also gives ingenious Transformagic ideas for making “Christmas trees” from tiers of old tables, “wreaths” from the rim of a wagon wheel, and Christmas “chandeliers” from an inverted piano stool or parts of Victorian furniture. These fun-to-do gifts, as well as trimmings for your home, are easily accomplished by following the basic-stroke technique of painting explained in the Transformagic booklet available at Du Pont paint dealers. With step-by-step applications of this “tear-drop” stroke, straight or curved, you can develop designs ranging from simple borders to flowers, wreaths, hearts, whimsical angels, or whatever your fancy dictates. Spectacular in its performance of converting a drab surface into a brilliant, decorative finish of genuine beauty, a new, aluminum plastic spray is announced which is applied by merely pushing a cap atop a conveniently held 12-ounce metal spray bomb. The spray is recommended for both interior and exterior use and forms a durable, weatherproof coating. In use, the Krylon Aluminum Plastic Spray bomb is held about 10 inches away from the surface to be coated, and the hand kept in motion so as to produce an evenly distributed finish. The container holds sufficient spray to cover approximately 100 square feet and will air-dry in five to ten minutes and dry hard in two hours. The spray action is automatic and operates by the mere pushing of the cap. There are no plungers or agitators to operate. Krylon Aluminum Plastic Spray offers a new, quick, easy, and effective method for beautifying and protecting all manner of fixtures, metal parts, and other surfaces. By means of masking tape and stencils, artistic designs of gleaming aluminum may be sprayed on salvers, vases, bowls, urns, and other pieces, to form permanent decorations of charm and refinement. The retail price of a 12-ounce spray bomb, ready for use, is $1.95. It is made by Chamberlain Metal Products Mfgs., 1466 West Madison, Chicago 7, Illinois.